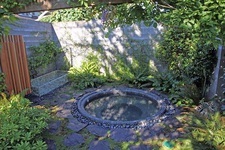 This unique, newly remodeled 1922 carriage/guesthouse is set within a beautiful Japanese garden just behind Northeast Portland’s Yakuza Lounge in the Alberta Arts District. The Kuza Garden Cottage is an artful blend of the urban and bucolic and sleeps 1-2 adults. The 350-square-foot cabin has been newly updated with birch flooring and simple contemporary design details including a new queen-sized bed, full bath with sunken step-in shower, full kitchen with settings for four, sitting room, bedroom flat-screen TV with cable and DVD, A/C and complimentary Wifi. Checkout The Kuza Garden Cabin on Airbnb.